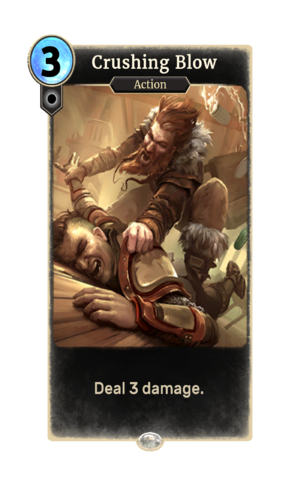 Crushing Blow is a common Neutral action card. It is part of the Core Set. In addition to the card's availability in the Core Set, three copies are included in the Aela's Companions theme deck, three copies in the Band of Survivors deck, and two copies in the Tribunal Glory theme deck. A premium version of this card with alternate artwork was available in the Mad Prince Pack.